Check out the article I wrote for Grid Magazine. It appears in the April 2012 edition and hard copies should be out soon! Flip to the very last page to view the piece! I just realized I didn't post any images of sailing from last summer (2011)! While we did less sailing overall than in 2010, it was mainly due to a very busy summer that didn't even afford more than a week off for either of us. Sigh! We did, however, manage to take my father and stepmother out for a day sail in July when they visited from Bangkok, Thailand. My father's photos of the outing (below) show his mastery of storytelling with photography, and his fantastic fish-eye lens managed to do the best justice to the scale of our boat I've seen thus far! To see more of his photos, visit Dr. Jeff Harper's photo blog. Going under one of the many bridges we pass in order to get to the Chesapeake side. It always kinda feels like we won't clear it, but of course we do. At the helm... It feels so great when the boat has picked up some good steady wind and is moving along at a comfortable tack. It's a sailor's life for me. When these photos were taken we'd just gotten finished scrubbing the decks (or swabbing, if you prefer). Teak wood takes on a silvery hue with a few days of exposure to the elements, but if you take a scrub brush and some natural cleaner to it, you can reveal its lovely golden hue. The effect is short lived, however. 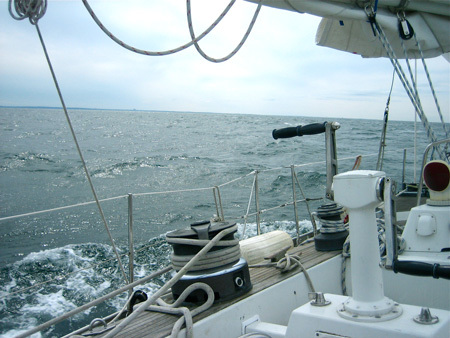 Teak is used on sailboats since nothing eats it and it stands up well to the harsh ocean environments. A full jib is what we like to see. Our marine GPS is my favorite instrument on the boat. Full of info, and helps us avoid rocks. Admittedly, I've been pretty behind in documenting our sailing outings this summer. Now, with the weather turning colder and my camera finally downloaded, I can sum up the experience. It was a season full of firsts for me. It was my first time sailing down the coast, heck, my first time on a sailboat out at sea! 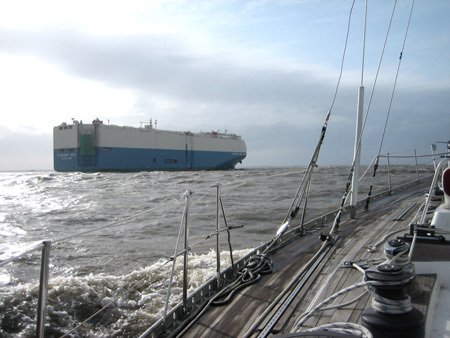 Followed by a month or two of sheer terror at the possibility of running aground and the generalized fear of disaster. As the blind fear wore off slowly and I began to understand the principles of sailing on such a large boat, I started to enjoy our outings. Soon I relished the feeling of the wind catching in our sails, tilting us over and steadily propelling us through the waves. On the hottest day of the year we took out a few friends for a day sail. It was literally 110 degrees in the shade. The light breeze felt like a hot desert wind and there wasn't much in the way of brisk sailing that day. 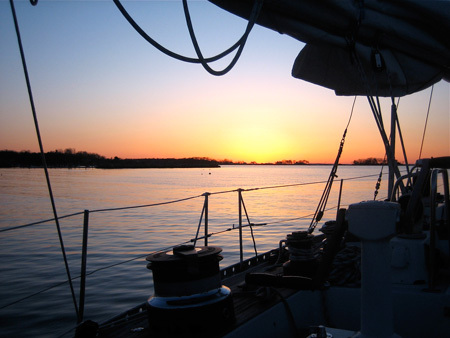 Nevertheless we anchored in the shallow north Chesapeake and swam in the brackish water that could have been bathwater. Mac (in the captain's hat) resisted getting in to cool off - his reasoning? "The sharks like the shallow water!" This was our first 'on-wings' sail configuration of the summer. My mother and friends (visiting from Virginia) enjoyed the day out with us, even though we didn't have much luck with the wind that day either. My mother still enjoyed flaking the sail in and out to get the optimal amount of efficiency. Despite checking the weather (as has become my ritual the night before and the morning of a sailing outing) it became clear this day once we got out into the Chesapeake that some stormy weather was upon us. This roiling sky, though very menacing looking didn't do much other than keep the powerboat people at home. As we headed down further into the Chesapeake, we realized the bad weather was going to give us some fantastic sailing conditions. We got up to speeds of about 16 knots or so and occasionally scared ourselves a bit with the amount of tilt the boat achieved. Our fellow sailors enjoyed the 20 to 25 knot winds as well. After lunch we headed back up towards home. Our guests cozied up down below while Jason and I got soaked to the bone once the rain started falling, and we stayed that way for the several hours it took to get back to the marina. It was great. This shot is of our first overnighter anchored out on the bay. It was also the first (successful) time Jason and I took the boat out with just the two of us, as we had a lot of trouble getting anyone to join us for an overnighter. We sailed all day in fantastic conditions. Our point of sail was perfect agains the wind direction, so we were able to sail for several hours without changing a thing. It was the first day I looked around and said to myself 'we are a couple of badasses!' When the sun started to set we began looking for a place to anchor. We settled just across the bay from Baltimore, seeing the glittering lights brighten up in the distance as the sun dipped out of sight. The water was glassy and we saw several blue crabs swimming close to the surface, and fish jumping all around. Once it got dark the wind picked up and an internet search alerted us to a storm which wasn't in the forecast when I had checked that morning. It never actually rained, but the wind was high and our moods were alert as we had no frame of reference for this experience. Neither of us slept much that night since we feared the wind would help break loose our anchor hold and drag us into something solid. We set the alarm for every hour to check that we were in the same place... and our fears were unfounded as it solidly held all night. We brought up the anchor at 5 AM and took turns motoring in shifts back towards home. During one of my shifts I heard the engine sound change. Since I started sailing I've become very, very sensitive to noises. If I don't know what that noise is, I am in high alert. The frequency changed quickly and then just stopped... suddenly I realized we were without power in a shipping channel, and I was the only one awake! I managed to steer us out of the shipping channel with the remaining momentum we had and ran downstairs to wake up the mechanic. With a wealth of adrenaline running through my veins I went back upstairs to keep watch while Jason diagnosed the problem. Luckily the wind and the current were working in our favor and we drifted towards more open water in a predictable way. The engine problem was simply that the one of three fuel tanks I was on ran empty, and a quick switch over to one of the other tanks solved the problem. Phew! This past weekend we ventured into the north Chesapeake for the first time. 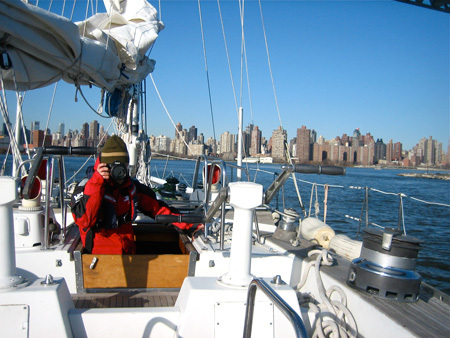 It was exhilarating, as all of our sailing outings up until this point have been out in the wide, sparse Delaware river. We always went that way because we needed the training wheels, and we knew the water was a little trickier depth-wise on the Chesapeake side. But with the addition of a nice new chart plotter that shows us depths and lots of other info, we felt confident enough to try it. We all had a fantastic time. It was Saturday, July 3rd; hot and clear with light winds and there were lots of other pleasure crafts out. I thought this might make me nervous since the chances of a collision are higher, but all of the boats seemed to easily find their own space on the waterways. 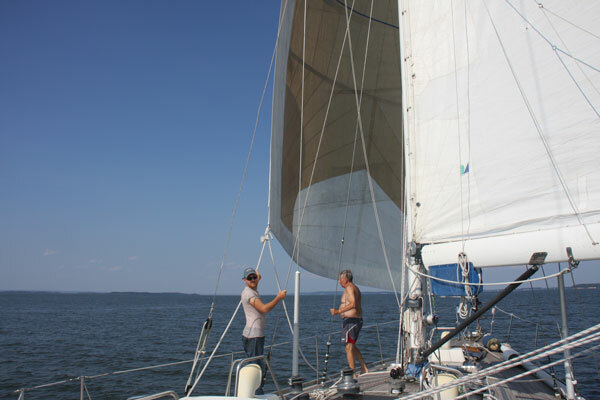 We put the jib and mainsail up at the same time, which was a first for us - and it felt so right! We enjoyed tacking down the channel with ease, giving beach-goers a show and waving to passing sailboats. We even came across some new friends of ours that Jason met in San Francisco last month. We'd never seen their boat, but they recognized us and circled around to chat for a minute. They encouraged us to come and anchor out overnight with them...but that's next on our homework assignment sheet - we have a little prep work to do before we can manage it. Once we got back to the marina, we motored all the way down to the fuel dock and Jason executed a perfect turn (no correction needed) to sidel up to it. Bravo! Not such an easy thing to accomplish with a boat almost as long as a semi! These are pictures from the 3 day boat delivery we made down the eastern US coast from Connecticut to Delaware. It took us 3 solid days of sailing, some queasiness, some exhilaration, some fear and lots of frozen fingers and toes. Overall it was amazing to experience sailing down the coast, to feel the wind take the 57 foot Nautor Swan and lift it just slightly further out of the water and propel it forward, getting pushed along by the big rollers along the eastern seaboard. Now that the boat is in Delaware, we can start moving our belongings onto it for what promises to be a really interesting summer. Getting used to having less stuff, fixing up a home that's 'ours' and discovering a whole new set of challenges. I constructed this illustration on July 24th 2006. Three years ago today I was thinking about sailboats - well, as far as their metaphorical and emotional properties were concerned...not actual boats. Today my significant other is just closing on an actual sailboat that we plan to move onto in the next 6 to 8 months. There may be ocean voyages in the future, if we can build up enough nerve. But certainly it will be an adventure...even if it simply sits at the dock. 2) As a child living in London, I thought that having a life on a houseboat would be the absolute coolest thing on earth. Our family even looked at houseboats to purchase, but that never materialized because we couldn't find one that would clear my dad's height. 3) I have a recurring nightmare that shows up a few nights a year (mostly when I'm feeling stressed) involving watching a huuuuggge wave building power and towering over me in eerie silence. I'm standing helplessly behind a flimsy sliding glass door, waiting for whatever is inevitably next. I never get to find out if the glass door holds the water out or if it shatters through into my small room. So, it looks like I will be presented with plenty of opportunities to get over my apprihension of the deep blue.